"Bertrand Russell was a British philosopher, logician, mathematician, historian, writer, social critic and political activist. He is considered one of the founders of analytic philosophy along with his predecessor Gottlob Frege, colleague G. E. Moore, and his protégé Ludwig Wittgenstein. He is widely held to be one of the 20th century’s premier logicians. Russell was a prominent anti-war activist; he championed anti-imperialism and went to prison for his pacifism during World War I. Later, he campaigned against Adolf Hitler, then criticised Stalinist totalitarianism, attacked the involvement of the United States in the Vietnam War, and was an outspoken proponent of nuclear disarmament. 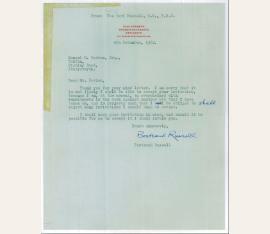 In 1950 Russell was awarded the Nobel Prize in Literature." Mathematiker, Philosoph und Nobelpreisträger (1872-1970). Autograph letter signed. Llan Ffestiniog. 1½ SS. Kl.-4to. 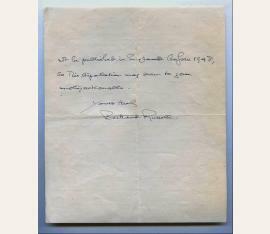 To the British couturière and feminist Elspeth Fox Pitt, née Phelps (1877-1968), thanking for an invitation for himself and his wife "Peter" (i. e. Patricia, née Spence): "[...] Peter + I both wish we could accept it, but [...] I am going to Norway for the British Council, & then to Berlin for the Foreign Office, & while I am away Peter has to look after our son Conrad. However, after the end of October we shall be in London, at 18 Dorset House [...] Dorset House has a restaurant, so we can always give you a meal without difficulty [...]". - On bluish stationery with printed address. British philosopher and Nobel laureate (1872-1970). 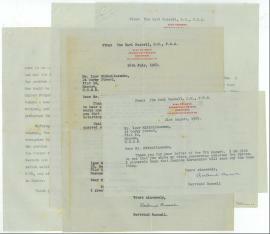 Four typed and signed notes and letters. N. p. Four letters with their envelopes. 4to and oblong 8vo. Altogether 6 pp. on 6 ff. All addressed to the Russian journalist and poet Igor Mikhailusenko (b. 1932) concerning Russia and the cold war: "[...] I believe that the two German States are equally dangerous. Western Germany is fanatically obsessed with the cold war and Eastern Germany is a cruel, vicious tyranny, capable of keeping its population within its borders only with barbed wire and machine guns. I think that the Government of the Soviet Union and the Government of the United States have a responsibility to come to an agreement which reflects the interests of peace and not the interests of either German State. 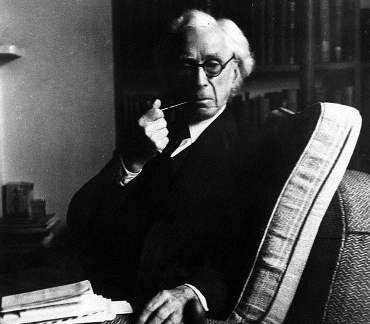 Bertrand Russell (1872–1970), Philosoph, Mathematiker und Nobelpreisträger. E. Brief mit U. Cambridge, 6. Juli 1946. 1½ SS. Kl.-4°. Mit e. adr. Kuvert. – An den Mathematik- und Astronomiehistoriker Joachim Otto Fleckenstein (1914–1980) in Basel: „I am sorry I had not time to answer your letter before leaving Switzerland. The translation rights in ‚Physics + Experience’ belong to the Cambridge University Press. I should agree to anything satisfactory to them, with one proviso: ‚Physics + Experience’ is one chapter in a large book I am writing, + I should wish to reserve the right to have it appear at its proper place in a translation of that book. The book, however, will certainly not be published in England before 1948 [...]“. – Auf Briefpapier mit gedr. Briefkopf des Hotel Portmeirion; die Verso-Seite mit Eingangsstempel v. 12. Juli 1946. 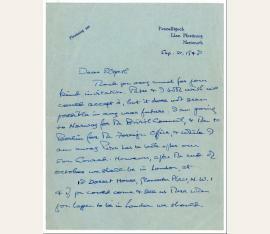 Typed letter signed ("Bertrand Russell") with an autograph correction. 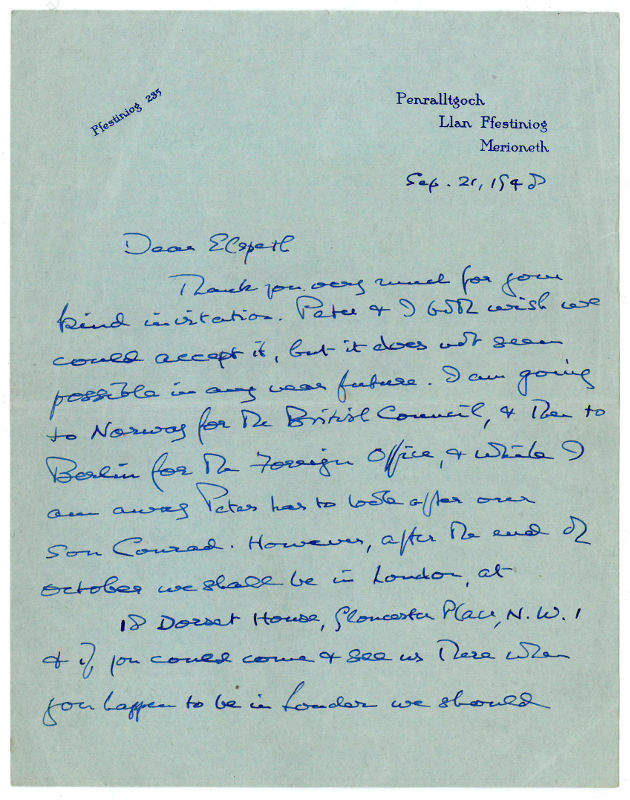 To his friend and colleague, the physical chemist Professor Mansel Morris Davies (1913-95) in Aberystwyth: "[...] I am sorry that it is not likely I shall be able to accept your invitation, because I am, at the moment, so overwhelmed with commitments in the work against nuclear war that I have taken on, and in projects such that I will [corrected to: shall] be obliged to reject many invitations I should wish to accept. I shall keep your invitation in mind, and should it be possible for me to accept it I shall inform you [...]" - An eminent historian and philosopher of science, Davies taught at Aberystwyth from 1947 to 1977. His obituary described him as "a passionate crusader for social and political justice, a lifelong militant pacifist, a Pugwash participant, a committed humanist with strong leanings towards Buddhism, a prolific author and letter writer, a discriminating collector, a riveting anecdotalist, a man of omnivorous literary, musical and scientific tastes". - Traces of folds and of scotch tape along edges of upper left corner. 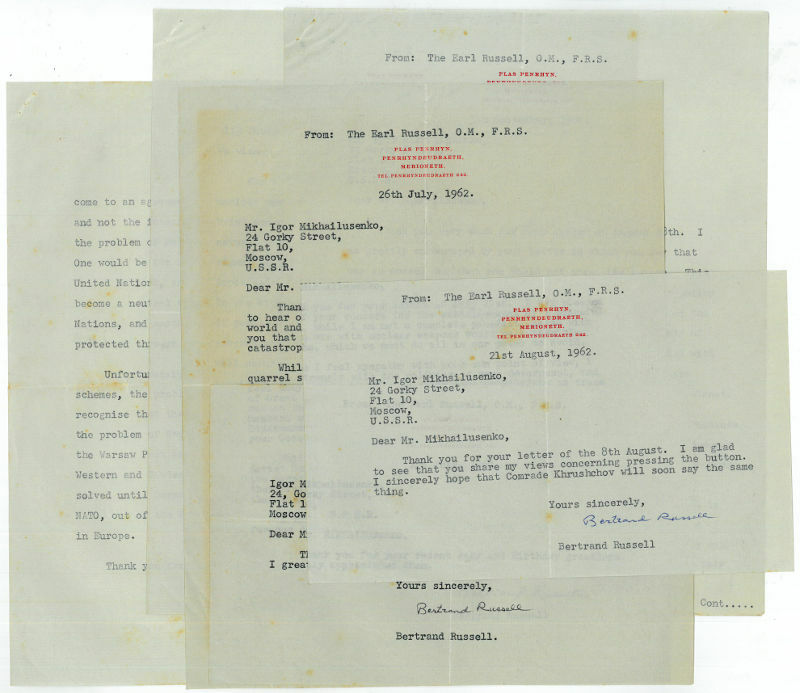 On Russell's stationery with printed Plas Penrhyn letterhead (watermarked "Papyrus Regia").